We're rolling out a new segment (that, like most of our recurring segments, will never be seen again) this week here at RBM - a totally original idea we invented that we're calling Throwback Thursday (#TBT), where we'll revisit some of the highs and lows of Ottawa Senators history. With the Sens rolling out a largely-homegrown roster night after night this season, it's easy to forget that this team wasn't always as adept at spotting and landing talent at the annual NHL entry draft. From the head-scratching decision to draft Brian Lee over... well... everyone else in the draft class; to the dumb-in-hindsight move to take Alexandre Daigle over whomever it was that was drafted second (spoiler: it was Chris Pronger); right down to drafting Mathieu Chouinard twice - the Senators have had a few misses over the years. But perhaps the greatest miss of all was the year that the John Muckler braintrust went way off the board in the third round and drafted a 6'10" defenceman out of Rocky Mountain House, Alberta, who was also a brown bear. "You have to remember what the early 2000s were like," explained the chief scout who brought the bear's tapes to Muckler's attention (the scout agreed to speak to RBM anonymously for this article). Still a better pick than Jakub Klepis. "The Air Bud and M.V.P. documentary series had shown us all that animals could play sports and NHL teams were engaged in an arms race, loading up on hulking defencemen who could keep the front of the net clear." "We really thought we'd found that." The Senators were just one of a number of teams that were thought to be kicking tires on a grizzly bear from Stewart, BC, but the scout said the team had concerns about that particular bear's character. "Sure, yeah, a grizzly would be intimidating back there but we had to think about the chemistry in the room," the scout said. "Grizzlies are pretty savage. We couldn't have one of our prospects literally tearing up and eating a veteran, you know?" "I mean yeah, we love a good position battle, but come on." 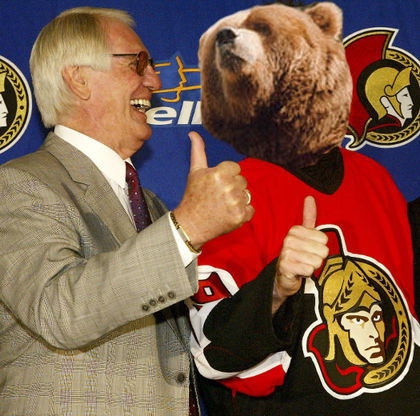 So the Senators settled on the slightly smaller and slightly more docile brown bear. "We'd seen some great tape of him foraging for berries and roots, he really knew how to establish body position and block out the smaller woodland creatures. That sort of net-front presence is hard to teach," the scout recalled. The pick was heralded as a progressive one from an organization often thought to be undersized and lacking in toughness but, in the end, it just didn't pan out. "He brought a lot of the intangibles we wanted - size, toughness, good hands... we really thought he would be the heir apparent to Chara back there. But in the end, his skating just wasn't at the level we needed it to be," the scout admitted with a sigh. "Plus, you know, he was a bear."